Verve Stamps: August Project Parade - Day 8! August Project Parade - Day 8! Wow! The Verve Divas have really outdone themselves this month! The projects and gift ideas are AMAZING!! Well, it's my turn (Laurie) to share with you what I have created! 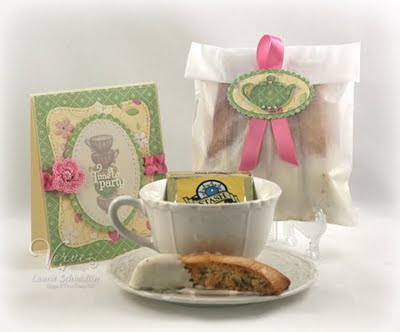 I decided to create a gift that could be used by the hostess of a tea party (but you could easily change the sentiment on the card and it could be for a hostess). 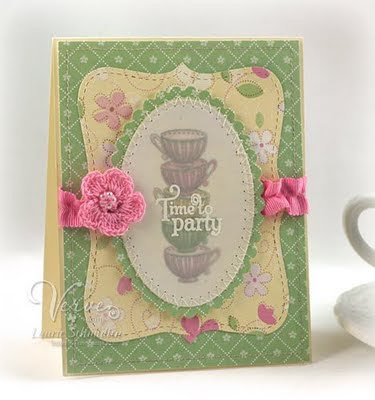 I used A Cup of Life and Party Time (for the sentiment) sets paired with some pastel and very girly patterned paper. I whipped up some Lemon Biscotti (dipped in White Chocolate), packaged them in a white glassine bag, and attached a coordinating sticker tag. Biscotti is one of my most favorite things to bake - they are so easy, yet people are always impressed with them! I have a few of my own favorite recipes, but this time I wanted to try a new flavor. I found THIS recipe online and have to say it has been a hit! So much so that when I wasn't looking this morning my kiddos had devoured most of them! Yep, these pictured above would be my SECOND batch! LOL! For my card, I stamped a "stack" of cups (from A Cup of Life set) using the masking technique, colored them with my Copics, and then added a vellum overlay with the "Time to Party" sentiment (from the Party Time set). We would love for you to join us this month! To play along, just make a project or card that shows us your take on the Happiness for Hostesses theme. Verve Stamps are not required, but if you've got 'em we love to see 'em! Then just add a link to your creation to the Mr. Linky form in DAY ONE's POST before 8PM Mountain September 12. Two lucky participants will win a stamp set of their choice from the Verve Store. We've also hidden another $25 gift certificate somewhere along the parade for a random commenter. So if you like what you see, be sure and give a little shout out in the comments of each post! Have fun and good luck!